There's no middle ground when it comes to Middle-earth. Although director Peter Jackson's "The Lord of the Rings" trilogy was a multi-billion-dollar franchise, it paradoxically retained a fanboy-cult flavor that left detractors completely unenchanted. Those who liked the movies adored them, and the J.R.R. Tolkien tomes from which they derived, with almost religious fervor. Those who didn't were bored senseless by all of the hiking, hammy Hobbits, hiking, high-fantasy hokum and hiking. The more-of-the-same "The Hobbit: An Unexpected Journey" takes place 60 years prior to the events of "The Lord of the Rings: The Fellowship of the Ring" and features some of the same characters. While each "Lord of the Rings" film adapted a single novel, the print version of "The Hobbit" will be the source of no less than three movies all by itself, with some padding from Tolkien's background notes. Whether this constitutes a mercenary money-making milking or a respectfully thorough treatment of the material will be up to each three-ticket buyer to decide. 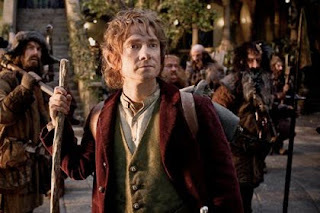 Bilbo Baggins (Ian Holm) and the much younger Frodo Baggins (Elijah Wood), two small in stature but big-footed Hobbits from the first trilogy, appear briefly to introduce the conceit that Bilbo is writing this account of an earlier adventure. Martin Freeman portrays the bygone-days Bilbo, a settled and unambitious homebody recruited by wizard Gandalf the Grey (Ian McKellen) to join a band of displaced Dwarves. They are on a mission to regain their long-lost homeland, captured in an action-packed opening sequence by the formidable Fire-drake (as in "dragon") named Smaug. One of the problems with Jackson's decision to make three movies out of "The Hobbit" is the director's frustrating refusal to give us a good look at Smaug, apparently so the character's big reveal can be a highlight of a later film. Instead, we see only terrified faces looking up at the creature, a few subliminal glimpses of Smaug flitting past and a single close-up of the dragon's sinister eye. After Smaug's dramatic conquest of the mountain stronghold, the movie dawdles through some boring bickering and bargaining between Bilbo and the Dwarves before they finally hit the road. Dwarf leader Thorin Oakenshield (Richard Armitage) is unimpressed by Bilbo, who therefore obviously is destined to prove his worth in various ways throughout the classically predictable plot. The movie's computer-generated creatures include dimwitted Trolls, swarms of Goblins and savage warriors known as Orcs. Andy Serkis once again gives motion-capture life to the creepy and pathetically needy Gollum, who manages to lose a certain rather significant ring to Bilbo. Settings such as the Dwarves' gold-filled mountain fortress Erebor, the Maxfield Parrish-picturesque Elven outpost Rivendell and the elaborate latticework of underground bridges in the Great Goblin's cave are stunningly detailed. But many parts of the movie look and play like segments from a video game, as Our Heroes face off against a succession of impossible-odds fantasy-world perils. Having a wizard along is the equivalent of the ultimate cheat code, of course. That doesn't mean those encounters aren't impressive. The strangest battle is a stormy clash between massive living mountains that hurl boulders at each other while Bilbo and company cling to narrow ledges. Another memorable cliffhanger involves the group literally getting stuck up a tree that's, well, hanging over a cliff. The same qualities about "The Hobbit" that should appeal to "Lord of the Rings" fans (similar look, similar characters, similar quest, similar excessive hiking) also may feel a little redundant. That means the movie is unlikely to win over anyone the first trilogy failed to charm. On the technical side, some theaters will be screening "The Hobbit" in a controversial new format known as High Frame Rate 3D. While the goal was to create a super-sharp high-definition presentation, the reality is that the HFR 3D image looks more like harshly unsubtle videotape footage than film. Seen in this "more real than reality" format, every scene of the movie ends up looking as if it were shot on a phony indoor set. Also, seeing the movie in 3D is recommended only for those who enjoy paying a premium to wear those horribly annoying glasses.